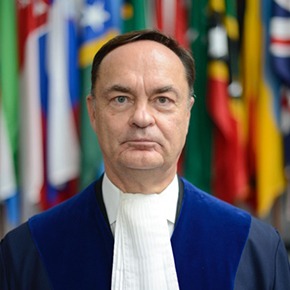 Judge Golitsyn is President of the International Tribunal for the Law of the Sea on 1 October 2014 for a three-year term. He was Head of the Division of Public International Law in the Ministry for Foreign Affairs of the former USSR and served as head or member of delegations at various negotiations on fisheries, navigation and maritime boundary matters, as well as the Arctic and Antarctica. In 2007, he acted as Chief Legal Counsel for the Russian Federation in two prompt release cases brought by Japan before the International Tribunal for the Law of the Sea. He was elected President of the InternationalTribunal for the Law of the Sea on 1 October 2014 for a three-year term. At the United Nations, he worked in the Office of the Legal Counsel and as Director of the Division for Ocean Affairs and the Law of the Sea. Judge Golitsyn is Vice-President of the Russian Association of Maritime Law and Professor of international law at Moscow State University and Moscow State Institute of International Relations. He completed his PhD on the legal regime of the Antarctic and is the author of three books and numerous articles on international law, Antarctica, the law of the sea and environmental law.